Making a home away from home is what campus residential life is all about. It’s also about enjoying new surroundings and learning to live in harmony with individuals who don’t share your DNA. Because a lot of your education will happen outside the classroom, Ohio Wesleyan asks students to live on campus all four years. On a residential campus like ours, you’ll interact easily and often with other students, faculty, and staff. Through everyday activities or special events, you’ll quickly become a part of the OWU community and find ways to make your own contributions here. You’ll learn leadership skills, make lasting friendships, get comfortable with making decisions—all of which will complement your academic endeavors. Regardless of where you live on campus, you’ll build the invaluable connections that highlight a liberal arts education. Stuyvesant Hall is one of six OWU residence halls. The Citizens of the World House is one of seven Small Living Units on OWU’s campus. Butler A. Jones was a former sociology professor, known for his work with race relations and the Civil Rights Movement. 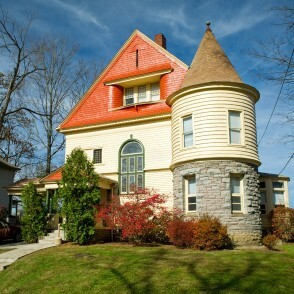 The House of Black Culture is one of OWU’s Themed Houses that carries Jones’s legacy. 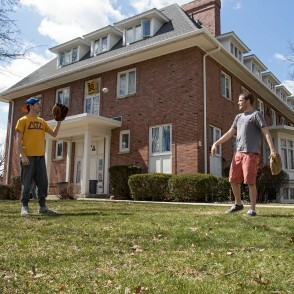 Adjacent to the residential halls, “The Hill” is home to five fraternity houses. It's all about fresh food and hospitality (and 24/7 dining options). That’s what you want and what you’ll get at OWU. No matter how complicated your daily schedule or dietary preferences are, you’ll find plenty of nutritious meals, from scratch with the freshest ingredients. Add anytime dining, 24/7 access, and "debit dollars," and you'll find a dining experience that is convenient and satisfying. Located in Hamilton-Williams Campus Center, this location now features "anytime dining" where you can dine as many times as you want in one day. Located on the first floor of Hamilton-Williams Campus Center, this location features both a fast-casual restaurant and a convenience store. Positioned on the residential side of campus in Smith Hall, this location offers unlimited meals around the clock. 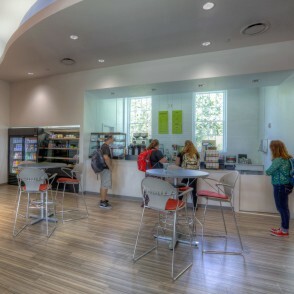 Located on the first floor of Merrick Hall, this academic-side café offers favorites from the "We Proudly Serve Starbucks" line and made-from-scratch breakfast and lunch items. Smith Hall is the largest of OWU's residence halls, with five stories in two wings joined by a two-story community area. Smith residents live in suites with two double rooms, a common room, and shared bath. 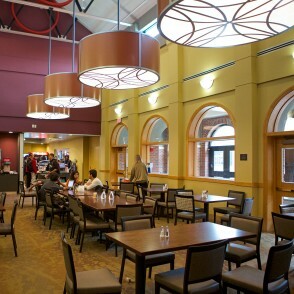 Smith Dining Hall is ranked by students as the best place to eat on campus. Smith West is substance-free. 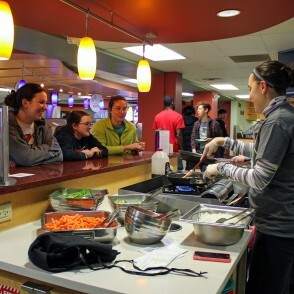 Located in Hamilton-Williams Campus Center, The Marketplace features everything from sushi to salad making it a popular lunchtime destination. Thomson Hall is home to just over 100 students, and is single-gender by floor. If you love to snack and have extra food points, you're in the right place, because it also houses a convenience store. Welch Hall is a Living-Learning Community for Honors students. It offers special opportunities for involvement and a 24-hour quiet policy. Smith Hall, a coed residence hall hosting 350+ students, features large common room, complete with a television, couches, foosball tables, and a pool table. 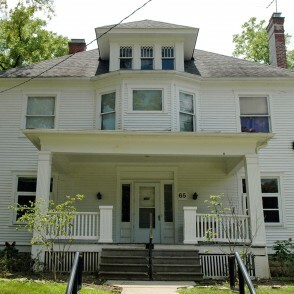 Resting in a beautiful setting on Oak Hill Avenue, Honors House accommodates 11 honors students each year and hosts various honors activities. Stop by the "Ham-Wil" Atrium on the right day and you could be serenaded by a music student on the grand piano, greeted by dogs during the stress-free fair, invited to decorate cookies, or informed about OWU's clubs and organizations. 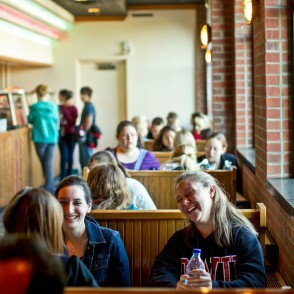 OWU features five sororities, including Delta Delta Delta. The sororities have nonresidential chapter houses for meetings and special events. Newly opened in Fall 2016, this Small Living Unit (SLU) building, a duplex-style home that houses two SLUs, is a living-learning community of students who share an interest in specific topics and issues.